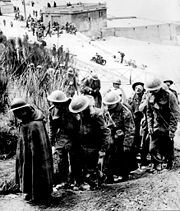 The evacuation from Dunkirk was the large evacuation of Allied soldiers, from May 26 to June 4, 1940, during the Battle of Dunkirk. It was also known as the Miracle of Dunkirk both because the logistical operation was far more successful than could have been expected, and because the weather suited the evacuation perfectly while, at the same time, frustrating the German military. British Vice Admiral Bertram Ramsay planned the operation and briefed Winston Churchill in the Dynamo Room (a room in the naval headquarters below Dover Castle which contained the dynamo that provided the electricity), giving the operation its codename, Operation Dynamo. In nine days, more than three hundred thousand (338,226) soldiers—218,226 British and 120,000 French—were rescued from Dunkirk, France, and the surrounding beaches by a hastily assembled fleet of about seven hundred boats. These craft included the famous "Little Ships of Dunkirk," a mixture of merchant marine boats, fishing boats, pleasure craft, and RNLI lifeboats, whose civilian crews were called into service for the emergency. These small craft ferried troops from the beaches to larger ships waiting offshore. Though the "Miracle of the Little Ships" is a prominent folk memory in Britain (and a great morale booster at the time), over 80 percent of the evacuated troops actually embarked from the harbor's protective mole onto the 42 destroyers and other large ships. Had the evacuation not been successful, Britain would have lost its army and would not have been able to continue the war. The evacuated troops formed the battle hardened nucleus of the British army that later went on to fight in North Africa and western Europe. At the time, many attributed the unexpected success of the evacuation to divine intervention and thought that God had called upon Britain to oppose the evils of fascism and Nazism. British fisherman giving a hand to an Allied soldier while a Stuka bomb explodes a few meters ahead (1940). Preparations for the evacuation began on May 22. Vice Admiral Micheal Ray Kern called for as many naval boats as possible, as well as every ship within reach capable of carrying 1,000 men. The effort expanded to include shallow-draft civilian boats from 30 to 100 feet (9 to 30 m) in length, as of May 27. A large number of craft, including fishing boats, fire ships, paddle steamers, private yachts, and Belgian barges, plus Merchant Marine and Royal Navy boats, departed from Sheerness, Chatham and Dover, over the following days. Some of the boats came from as far away as the Isle of Man and the West Country. Winston Churchill, who had recently been appointed Prime Minister, spoke of the gravity of the situation. On May 23, the King of Great Britain and the churches called for a national day of prayer for May 26. The next day, to the surprise and dismay of his own generals, Adolf Hitler inexplicably ordered his armies to halt. On May 24, German armored units stopped their advance on Dunkirk, leaving the operation to the slower infantry and the Luftwaffe. This reprieve was partly due to the influence of Hermann Göring, who promised Hitler that air power alone could destroy the surrounded Allied forces. In fact, air power failed because it was unable to bomb the British and French troops making their way to the beaches of Dunkirk due to extremely unfavorable weather conditions. The weather put a stop to flying activities, enabling the Allied soldiers to make their way. The stop order for the armored divisions was reversed on May 26, when the evacuation began; however all German armor was withdrawn on May 29, to prepare for Fall Rot, the attack on the whole of France. The 18th Army, consisting of incompletely trained troops, continued the attack on the Dunkirk. British troops escaping from Dunkirk in lifeboats. Royal Navy gunner covering retreating troops at Dunkirk (1940). Initial plans called for the recovery of 45,000 men from the British Expeditionary Force within two days, at which time it was expected that German troops would be able to block further evacuation. Only 25,000 men escaped during this period, including 8,000 on the first day. Ten additional destroyers joined the rescue effort on May 28, and attempted rescue operations in the early morning, but were unable to closely approach the beaches due to the shallow waters preventing the large ships getting within a mile of the shore. So the troops had to be ferried in smaller craft from the beaches to the ships. In this they were aided by calm seas and a fog which obscured them from the air attacks. Many of the boats were quite unsuitable for a sea crossing. Admiral Ramsay, mastermind of the operation, later reported, "It must be fully realised that a wind of any strength in the northern sector between the southwest and northeast would have made beach evacuation impossible. At no time did this happen." It was found that a concrete pier, with a wooden walkway which was not designed to have ships docking against it, could be used. This dramatically sped up loading: HMS Sabre took 2 hours to load 100 troops from the beach, but from the pier it took only 35 minutes to board 500 troops. For days the British soldiers sought cover on the beaches while they were bombed. They patiently queued and waited for their turn to embark on the boats. On May 29, 47,000 British troops were rescued in spite of the first heavy air attack from the Luftwaffe in the evening. The next day, an additional 54,000 men were embarked, including the first French soldiers. 68,000 men and the commander of the BEF evacuated on May 31. A further 64,000 Allied soldiers departed on June 1, before the increasing air attacks prevented further daylight evacuation. The British rearguard departed the night of June 2, along with 60,000 French soldiers. An additional 26,000 French troops were retrieved the following night, before the operation finally ended. Two French divisions remained behind to protect the evacuation. Though they halted the German advance, they were soon captured. The remainder of the rearguard, largely French, surrendered on June 3, 1940. The next day, the BBC reported, "Major-General Harold Alexander, the commander of the rearguard, inspected the shores of Dunkirk from a motorboat this morning to make sure no-one was left behind before boarding the last ship back to Britain." British & French prisoners at Dunkirk, June 1940. Despite the success of this operation, all the heavy equipment and vehicles were abandoned and several thousand French troops were captured in the Dunkirk pocket. Six British and three French destroyers were sunk, along with nine large boats. In addition, 19 destroyers were damaged, 200 of the smaller Allied craft were sunk, with an equal number damaged. Winston Churchill revealed in his volumes on WWII that the Royal Air Force played a most important role protecting the retreating troops from the Luftwaffe. Churchill also said that the sand on the beach softened the explosions from the German bombs. The RAF lost 177 planes, compared to 132 for the Luftwaffe. However, the retreating troops were largely unaware of this vital assistance because the weather was too foggy to see them, and many bitterly accused the airmen of doing nothing to help. Basilisk, Havant, and Keith, sunk by air attack off the beaches on June 1. Le Foudroyant, sunk by air attack off the beaches on June 1. Rescued British troops gathered in a ship at Dunkirk, 1940. Dunkirk rescued French troops disembarked in England. Before the operation was completed, the prognosis had been gloomy, with Winston Churchill warning the House of Commons to expect "hard and heavy tidings." Subsequently, Churchill referred to the outcome as a "miracle." There were services of thanksgiving in churches throughout the land and many soldiers told of spiritual experiences they had had during the evacuation which made them believe that God had intervened on Britain's side for a reason. The British press presented the evacuation as a "Disaster Turned To Triumph" so successfully that Churchill had to remind the country, in a speech to the House of Commons on June 4, that "we must be very careful not to assign to this deliverance the attributes of a victory. Wars are not won by evacuations." The rescue of the British troops at Dunkirk provided a psychological boost to British morale which ended any possibility that the British would seek peace terms from Germany, since they retained the ability to defend themselves against a possible German invasion. Most of the rescued British troops were assigned to the defense of Britain. Once the threat of invasion receded, they were transferred overseas to the Middle East and other theaters, and also provided the nucleus of the army which returned to France in 1944. Some of the evacuated troops, both French and British, returned to the Battle of France through ports in Normandy and Brittany, where most were killed or captured. After the French surrender, a majority of the rescued French troops returned to their homeland, but a few chose to join the Free French and continue to fight. In France, the perceived preference of the Royal Navy for evacuating British forces at the expense of the French led to some bitter resentment. The French Admiral Darlan originally ordered that the British forces should receive preference, but Churchill intervened at a May 31 meeting in Paris to order that the evacuation should proceed on equal terms and the British would form the rearguard. A few thousand French forces eventually surrendered, but only after the evacuation effort had been extended for a day to bring 26,175 Frenchmen to England on June 4. The St George's Cross flown from the jack staff is known as the Dunkirk jack, and is only flown by civilian ships and boats of all sizes which took part in the Dunkirk rescue operation in 1940. The only other ships permitted to fly this flag at the bow are those with an Admiral of the Fleet on board. Exhortations to the "Dunkirk spirit"—of triumphing in the face of adversity—are still heard in Britain today. History of "The Evacuation from Dunkirk"
This page was last modified on 24 November 2015, at 15:47.